Today I continue to smoke my way through the suite of lanceros that are exclusive to Stogies World Class Cigars. Stogies is a Houston-based retailer, public lounge, and an online shop that has commissioned some of the industry’s best brands to produce its family of lanceros. Called H-Town in honor of Houston, the lanceros are made for Stogies by esteemed brands like La Palina, Alec Bradley, Crowned Heads, Quesada, Room 101, and Fratello. If, like me, you tend to lament the trend towards large ring gauge vitolas, you’ve got to be a fan of what the folks at Stogies have been up to. In September, Pete Johnson’s Tatuaje brand joined the H-Town brigade with a new lancero. The cigar is available online for $50 for a 5-pack or $190 for a box 20. Only 10,000 total cigars will be made. The Tatuaje H-Town Lancero (7 x 40) recipe calls for an Ecuadorian Sumatra Rosado wrapper around Nicaraguan binder and filler tobaccos. It is made at the My Father Cigars factory in Nicaragua. Dark and slightly reddish in appearance, it sports a triple-cap finished with a pigtail top and a lumpy, mottled exterior with toothy texture and a few large veins. The pre-light notes at the foot include a hearty dose of toffee and caramel. Right out of the gate the profile is big and bold, yet nonabrasive, and the texture is leathery and concentrated. Cayenne spice, espresso, creamy nut, and nougat sweetness are predominant. Background notes of subtle mint and cocoa conjure slight similarities to The Hyde, which I recently called a “candy bar of a cigar.” While the H-Town isn’t nearly as candy-forward, I’ll speculate there might be some overlap in the tobaccos used for the two blends. As the Lancero progresses, flavors of citrus, chocolate, oak, and burnt marshmallow add depth as they come and go. Along the way construction is superb. The burn line stays even throughout, the ash holds firm, the draw is always easy, and the smoke production is very high, especially for a lancero. 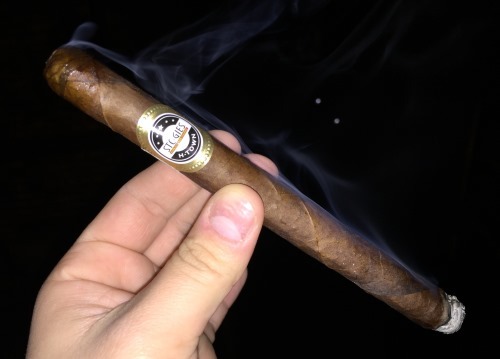 Pete Johnson and the folks at My Father Cigars put their best foot forward when they crafted this excellent smoke for Stogies World Class Cigars, and $10 is a very fair price. It’s a limited production lancero you won’t want to miss, and one that’s worthy of a four stogies out of five rating. While having some nerve tlrobues in my back, I once had a doctor warn about the evils of smoking and the nervous system. She equated my smoking a cigar with putting a coral snake in my mouth. I only wish I’d thought at the time to challenge her – I put a cigar in my mouth; she puts a coral snake in hers….and we see who dies first.